The charming island of Barbados spans a mere 166 square mile area. Yet mile per mile, it’s amazingly packed with more attractions than any other place in the Caribbean. For their winter escape, tourists flock to Barbados to bask in the glorious sun, surf and sand of this tropical paradise. Spread along the shores of Barbados are beautiful beaches, resplendent in their diversity and coral formations. Nature has created interesting coral sculptures from the relentless pounding of the waves and weathering of the rocks. Barbados beaches typically consist of fine grain coral and sand, with a few exceptions. Natural sand dunes are rare; they are only found on the southwest shores in Long Bay. On the north coast, a few sheltered coves are present. Cliffs of sandstone and coral rocks rise from the sea. On the east, Atlantic waves crash the wide and wind-swept beach, making it a thrilling sport for surfers. The west coast is a peaceful oasis, with its white sands, serene turquoise waters and palm trees gracefully swaying in the breeze. Tourists indulge in their watersport of choice, such as snorkelling, kayaking, jetskiing, or cruising on a catamaran. Others simply loll lazily in the sun’s warmth or take a refreshing dip in the ocean. Down south are coral reefs and pristine sandy beaches. The south and southeast are blessed with active surf perfect for boogie boarding, kite surfing and wind surfing. It’s a toss-up among equally dazzling beaches. However, Crane Beach deserves special mention for being ranked among the top ten beaches in the world by Lifestyles of the Rich and Famous. The view from the cliff edge is simply spectacular. However, only the most experienced swimmers dare to venture into the strong waves, under the watchful eyes of lifeguards. Wherever direction or beach you’re headed is bound to be an invigourating yet relaxing experience. Just bring a couple of swimsuits and a carefree attitude. Exploration and Entertainment Joining an island tour is an awesome adventure to discover the attractions around the island. Explore the historic sites, mysteriously enthralling caves, botanical gardens, or learn all about the origins of rum. Go on a jeep safari to take in the sights of tropical flora and fauna. Delve into the underwater life with a submarine tour. Glimpse a stunning panoramic view of landscapes and seascapes on a helicopter ride. Hop over to St. Lawrence, the island’s entertainment capital and party destination of people from all over the world. Enjoy the superb performances of live bands, sing along and dance till you drop. Sample the delicious Caribbean cuisine and cocktails. Socialise with locals and guests at hip clubs and bars. The vibrant Barbados nightlife keeps its lively beat throughout the year. 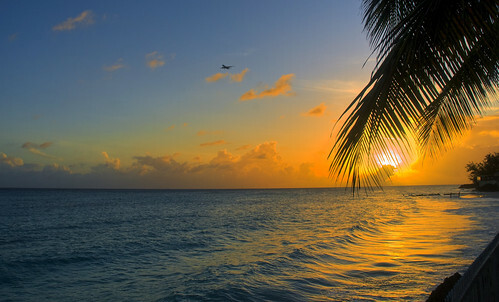 Barbados pulsates with the rhythm of the waves and exuberance of the islanders. Various festivals, creative performances, arts and crafts, conventions and conferences draw international crowds. Art galleries exhibit the works of local and global talents. Dining and wining events are celebrated practically each day and night. Beach barbecues, wine and jazz evenings, Sunday buffets, pub quiz nights, food fiestas, after office limes and more are offered to the delight of epicureans. For sports players and fans, cricket, watersports and horseracing are available all year round, aside from seasonal sports. Spectator sports and recreational activities abound for tourists of all ages and interests. The birthplace of rum and Rihanna, Barbados beckons to one and all. The island is sultry yet sophisticated, free-spirited and friendly. Toss every care to the winds and have loads of fun in the sun. This article was produced by leading designer swimwear boutique Beach Cafe – stockists of a wide range of beachwear and other items perfect for a sunny vacation.